The G40 features brand-new technology throughout its 4.8kg frame. Barely a day after Intel's formal announcement of the new Centrino/Santa Rosa platform comes a power-packing laptop from Toshiba Japan based on the Centrino Core 2 Duo T7300 CPU and featuring an HD DVD burner. 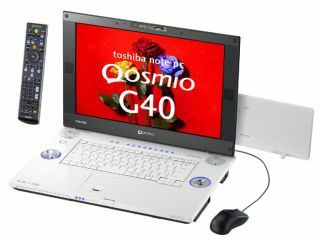 At ¥430,000 (£1,800), the 4.8kg Qosmio G40 is far from cheap, but it does have some compelling technology. Aside from the new Intel gear and the HD DVD-R drive, there are two 160GB hard drives, a 17-inch 1920 x 1200-pixel widescreen, 1GB of 'TurboMemory' flash memory for quicker boot times, 1GB of regular RAM and a 256MB NVIDIA GeForce 8600M GT graphics card. Given that the G40 also includes analogue and digital TV tuners, an HDMI connection (among many other ports), Windows Vista Home Premium and Office Personal 2007, maybe the asking price isn't too far off the mark after all. Available in Japan from the end of this month and worldwide soon after.